The syntheses of multiple qualitative studies can pull together data across different contexts, generate new theoretical or conceptual models, identify research gaps, and provide evidence for the development, implementation and evaluation of health interventions. This study aims to develop a framework for reporting the synthesis of qualitative health research. We conducted a comprehensive search for guidance and reviews relevant to the synthesis of qualitative research, methodology papers, and published syntheses of qualitative health research in MEDLINE, Embase, CINAHL and relevant organisational websites to May 2011. Initial items were generated inductively from guides to synthesizing qualitative health research. The preliminary checklist was piloted against forty published syntheses of qualitative research, purposively selected to capture a range of year of publication, methods and methodologies, and health topics. We removed items that were duplicated, impractical to assess, and rephrased items for clarity. The Enhancing transparency in reporting the synthesis of qualitative research (ENTREQ) statement consists of 21 items grouped into five main domains: introduction, methods and methodology, literature search and selection, appraisal, and synthesis of findings. The ENTREQ statement can help researchers to report the stages most commonly associated with the synthesis of qualitative health research: searching and selecting qualitative research, quality appraisal, and methods for synthesising qualitative findings. The synthesis of qualitative research is an expanding and evolving methodological area and we would value feedback from all stakeholders for the continued development and extension of the ENTREQ statement. Methods to synthesise qualitative research began with the recognition that providing evidence-based healthcare and health policy requires a range of evidence beyond that provided by the ‘rationalist’ model of systematic reviewing of quantitative research . Qualitative research aims to provide an in-depth understanding into human behaviour, emotion, attitudes and experiences. The synthesis of findings from multiple qualitative studies can provide a range and depth of meanings, experiences, and perspectives of participants across health-care contexts. Syntheses of qualitative research can pull together data across different contexts, generate new theoretical or conceptual models, identify research gaps, inform the development of primary studies, and provide evidence for the development, implementation and evaluation of health interventions [2–9]. The synthesis, or “bringing together” of the findings of primary qualitative studies is emerging as an important source of evidence for healthcare and policy . Many aspects of the methods for synthesising qualitative research are in the early stages of development. 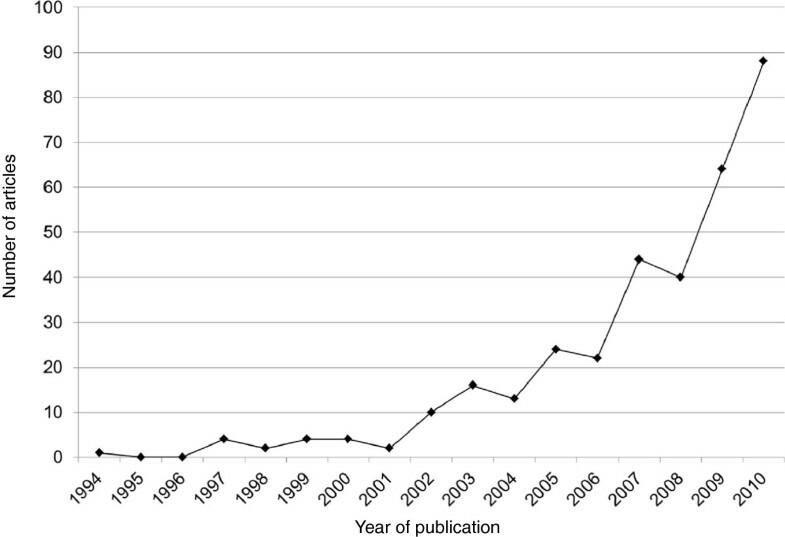 The number of published syntheses of qualitative health research is increasing (Figure 1). There are a wide range of qualitative synthesis methods with many common features, but also key differences . The main methods of qualitative synthesis include: meta-ethnography ; thematic synthesis ; critical interpretive synthesis ; narrative synthesis ; and meta-study [14–16]. One of the first methods identified for synthesising qualitative research - meta-ethnography - has subsequently influenced the development of other methods such as thematic analysis and critical interpretive synthesis through the use of its terminology and concepts, as well as extending and adapting its methods. Figure 2 provides examples of the wide-ranging terms used to describe different qualitative synthesis methods. Some of the adaptations of qualitative syntheses have, however, resulted in inconsistent use of terms for describing key stages of synthesis . For users of qualitative syntheses the different labels used to describe similar qualitative synthesis methods and the inconsistent use of terms to describe the different stages within qualitative reviews can be confusing [1, 18]. While there are differences in approaches and rationale for some qualitative synthesis methods (for example, Critical Interpretive Synthesis may be better suited for large diverse bodies of literature while meta-ethnography may be better for analysing a smaller number of papers)  there is a core set of techniques common to most qualitative synthesis methods. Number of published synthesis of qualitative health research. Word cloud of the methodological terms used in published synthesis of qualitative health research. Word clouds give more prominence to words that appear more frequently in the source text. The methodological terms were extracted from the title/abstract/full text of 381 published synthesis of qualitative health research (to 31st May 2011) and entered into Tagxedo, an online tool which generated a word cloud. While there are reporting guidelines for qualitative research , there are no published guidelines for reporting the synthesis of qualitative research. Reporting guidelines for quantitative systematic reviews exist and these are helping to set standards for both the conduct and reporting of these reviews . Currently, most synthesises of qualitative research have been undertaken by those with an interest in methodological development, and therefore reviews appear to be well-reported. Increasingly, the methodologies associated with synthesis of qualitative research are being used by researchers and students new to the process. It is important at this time to begin to establish reporting standards. Developing reporting guidelines for qualitative synthesis may assist researchers to improve both the conduct and reporting of qualitative syntheses and enable the end-user to better understand the processes involved in developing a qualitative synthesis. The aim of this paper is to report on the first phase of the development of guidelines to encourage transparency in reporting syntheses of qualitative research; to assist end-users to identify the core steps involved and to provide a tool to help clarify to the various concepts and terms used to describe similar processes in qualitative syntheses. It is acknowledged that there is no single best or correct approach to developing guidelines . Where feasible, we have reported the development of our guideline drawing from steps provided in ‘Guidance for developers of health research reporting guidelines’ by David Moher and colleagues , available at http://www.equator-network.org (an international initiative that seeks to improve reliability and value of medical research by promoting transparent reporting). We identified the need for a reporting guideline for syntheses of qualitative research as a result of our collective experiences in using, publishing, reviewing and teaching syntheses of qualitative health research, debriefing notes taken after an international conference symposium on the synthesis of qualitative health research (Qualitative Health Research Conference in Vancouver, Canada, 2010, KF/AT) and a seminar at the Qualitative Health Research Collaboration in Sydney, Australia, 2011, (AT/EM). To further establish a need for a reporting guideline, we conducted a comprehensive search for guidance and reviews relevant to the synthesis of qualitative research, methodology papers, and published syntheses of qualitative health research using the terms for “qualitative research” combined with terms relating to synthesis (systematic review, synthesis, thematic synthesis, meta-ethnography, meta-study, meta-analysis) (Additional file 1). The searches were conducted in electronic medical literature databases including MEDLINE, EMBASE, and CINAHL from inception to 20th May 2011, and in Google Scholar. Relevant organisational websites including the EQUATOR Network database of reporting guidelines (http://www.equator-network.org) and reference lists of relevant articles were also searched. We identified 381 syntheses of qualitative research, with the number of publications exponentially increasing from 1994 to May 2011 (Additional file 2, Figure 1). The initial items for inclusion in the preliminary “Enhancing transparency in reporting the synthesis of qualitative research (ENTREQ) Statement” were generated inductively from guides to synthesising qualitative health research [1, 10], seminal methodology papers [4, 11, 12, 22–24] and the authors’ experience in conducting and appraising qualitative syntheses (AT, KF, EM,). The items were compiled and grouped into five categories: introduction; methods and methodology; literature search and selection; appraisal; and synthesis of findings. In order to test our preliminary framework and to reach consensus for the inclusion of each item, the reporting framework was pilot tested against forty published syntheses of qualitative research, which were purposively selected from our search results to capture a range of year of publication, methods and methodologies, and health topics (Additional file 3). Three members of the research team (AT/KF/EM) independently piloted the guidance initially against 32 of these reviews, by extracting relevant data for each guidance item. During this time we met via teleconferences to discuss the results of the testing and made a series of revisions to the ENTREQ Statement. We removed items that were duplicated. Items were also rephrased for clarity where there was ambiguity. The revised statement was tested against the eight remaining reviews and no further changes were made. On average, it took 5 to 20 minutes to assess each review using the ENTREQ Statement. The results are provided in Additional file 3. The ENTREQ statement consists of 21 items grouped into five main domains: introduction, methods and methodology, literature search and selection, appraisal, and synthesis of findings (Table 1). For each item, a descriptor and examples are provided. Below we present a rationale for each domain and its associated items. State the research question the synthesis addresses. Identify the synthesis methodology or theoretical framework which underpins the synthesis, and describe the rationale for choice of methodology (e.g. meta-ethnography, thematic synthesis, critical interpretive synthesis, grounded theory synthesis, realist synthesis, meta-aggregation, meta-study, framework synthesis). Indicate whether the search was pre-planned (comprehensive search strategies to seek all available studies) or iterative (to seek all available concepts until they theoretical saturation is achieved). Specify the inclusion/exclusion criteria (e.g. in terms of population, language, year limits, type of publication, study type). Describe the information sources used (e.g. electronic databases (MEDLINE, EMBASE, CINAHL, psycINFO, Econlit), grey literature databases (digital thesis, policy reports), relevant organisational websites, experts, information specialists, generic web searches (Google Scholar) hand searching, reference lists) and when the searches conducted; provide the rationale for using the data sources. Describe the literature search (e.g. provide electronic search strategies with population terms, clinical or health topic terms, experiential or social phenomena related terms, filters for qualitative research, and search limits). Describe the process of study screening and sifting (e.g. title, abstract and full text review, number of independent reviewers who screened studies). Present the characteristics of the included studies (e.g. year of publication, country, population, number of participants, data collection, methodology, analysis, research questions). Identify the number of studies screened and provide reasons for study exclusion (e,g, for comprehensive searching, provide numbers of studies screened and reasons for exclusion indicated in a figure/flowchart; for iterative searching describe reasons for study exclusion and inclusion based on modifications t the research question and/or contribution to theory development). Describe the rationale and approach used to appraise the included studies or selected findings (e.g. assessment of conduct (validity and robustness), assessment of reporting (transparency), assessment of content and utility of the findings). State the tools, frameworks and criteria used to appraise the studies or selected findings (e.g. Existing tools: CASP, QARI, COREQ, Mays and Pope ; reviewer developed tools; describe the domains assessed: research team, study design, data analysis and interpretations, reporting). Indicate whether the appraisal was conducted independently by more than one reviewer and if consensus was required. Present results of the quality assessment and indicate which articles, if any, were weighted/excluded based on the assessment and give the rationale. Indicate which sections of the primary studies were analysed and how were the data extracted from the primary studies? (e.g. all text under the headings “results /conclusions” were extracted electronically and entered into a computer software). State the computer software used, if any. Identify who was involved in coding and analysis. Describe the process for coding of data (e.g. line by line coding to search for concepts). Describe how were comparisons made within and across studies (e.g. subsequent studies were coded into pre-existing concepts, and new concepts were created when deemed necessary). Explain whether the process of deriving the themes or constructs was inductive or deductive. Provide quotations from the primary studies to illustrate themes/constructs, and identify whether the quotations were participant quotations of the author’s interpretation. Present rich, compelling and useful results that go beyond a summary of the primary studies (e.g. new interpretation, models of evidence, conceptual models, analytical framework, development of a new theory or construct). The methodology and approaches selected are usually influenced by the research question (outlined in the introduction), intended synthesis output, reviewer’s philosophical position, context, and target audience. Also, reviewers may choose their approach according to the type of data available. For example, meta-ethnography works well with primary qualitative studies offering “thick descriptions” and in-depth analysis. Thematic synthesis is possible with “thinner” studies. 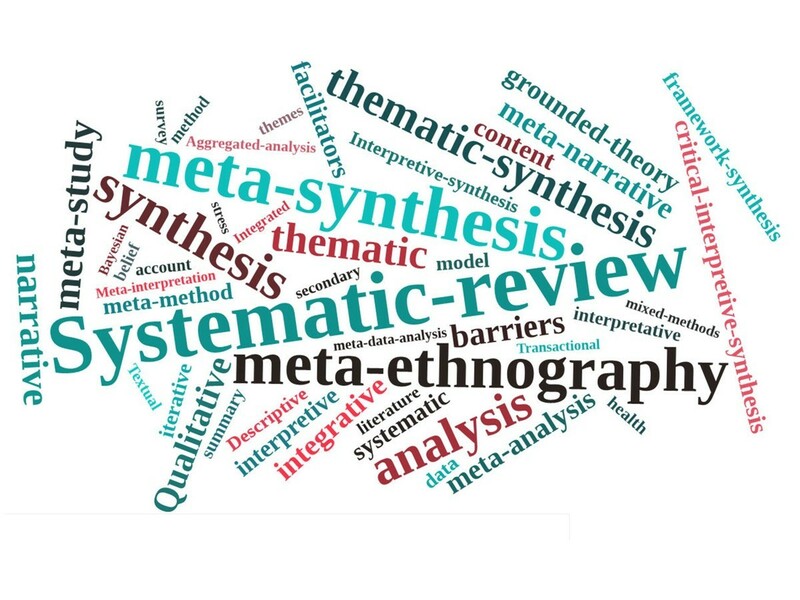 A recent review of qualitative syntheses found that nine main approaches were used to synthesise qualitative research including: critical interpretive synthesis, grounded theory synthesis, meta-ethnography, meta-study, thematic synthesis, meta-narrative synthesis, textual narrative synthesis, framework synthesis, and ecological triangulation . A summary of commonly used approaches for synthesising qualitative health research is provided in Table 2. *This is not a complete list of methodologies as methodologies for the synthesis of qualitative health research are wide ranging; **Adapted from Barnett-Page and Thomas  and Spencer et al. . †References selected to reflect a range of topic areas in health research. Conducting a systematic search which is reproducible and comprehensive is a distinguishing characteristic of a systematic review; however there are few developed and tested methods for locating qualitative research, and lack of consensus as to whether systematic searching is required . Some argue that exhaustive searching is not necessary. Instead, reviewers may adopt an iterative approach where all the available concepts rather than studies are sought until saturation is reached . A pre-planned sensitive search strategy may combine search terms relating to the population and context, with those relating to the health or clinical topic, and terms relating to experiential and social phenomena (such as knowledge, attitudes, beliefs, understanding, preferences, perspectives). These can then be combined with terms for qualitative methods and methodology. Methodological filters for qualitative research have been developed but have undergone little replication and validation . There are also differences in the indexing of qualitative research within electronic databases such as MEDLINE, EMBASE, PsycINFO and CINAHL. Within published syntheses of qualitative research there is often a lack of transparency about the search processes employed, with neither the search strategy nor databases detailed . For a comprehensive approach, the PRISMA flowchart is recommended for reporting the different phases of searching, screening and identifying studies for inclusion in the qualitative synthesis . Qualitative research can often be found in the grey literature (e.g. technical reports, working papers, thesis publications). To locate relevant studies, reviewers can search relevant organisational websites, Google Scholar, thesis databases, specialist journals, and consult with experts (researchers, providers, policy makers) in the relevant fields and librarians. The inclusion and exclusion of studies may be defined by factors including population characteristics, health or clinical topic, methods and methodology (philosophical approach), language, time frame, or type of publication; and this should be justified. For readers to make an assessment about the transferability of the findings to their own setting, a description of the study characteristics, screening process, and reasons for excluding studies is needed. Quality assessment of qualitative research is challenging and contentious . Just as there are no standardised criteria for assessing the quality of all quantitative research, standardising criteria for assessing the standard of conduct in all qualitative research which embraces a range of designs, is not possible or appropriate [31, 34]. Also, there is little evidence on how the quality of reporting reflects the robustness, trustworthiness and transferability of the findings of qualitative studies . Nevertheless, most published syntheses of qualitative research include a quality appraisal of the primary studies. The rationale underpinning quality assessment and the methods used to appraise quality vary widely but can be broadly characterised into three approaches: assessment of study conduct, appraisal of study reporting, and implicit judgement of the content and utility of the findings for theory development. Some syntheses exclude low quality studies, while others comment on or weight study findings according to their quality . Several appraisal tools have been used including the Critical Appraisal Skills Program (CASP)  which addresses the principles and assumptions underpinning qualitative research but does not claim to be a definitive guide; the Qualitative Assessment Review Instrument Tool (QARI) , which suggests general questions that require the reader to make a judgement for example about the “congruency” of the research methodology with the state philosophical perspective, research questions, data collection, interpretation of the results; and Consolidated Criteria for Reporting Qualitative Research (COREQ)  which is the only framework developed explicitly for assessing reporting. Some reviewers have developed their own appraisal framework selecting items from existing criteria [25, 39–41], augmented with additional criteria they deemed were specifically relevant to the research topic. These were usually identified by discussion and consensus among the research group. For example, Brunton et al. conducted a systematic review of qualitative research on children and physical activity and used existing criteria proposed for assessing quality of qualitative research but included an additional item, “actively involved children to an appropriate degree in the design and conduct of the study,” which they deemed relevant to their review . Systematic reviewers of qualitative studies have found that many primary qualitative studies are poorly reported . Also, some reviewers have found that studies with sparse detail about the conduct of the research tend to contribute less to the synthesis . An assessment of the quality of reporting can allow readers to make an informed judgement about the credibility (can the research findings be trusted? ), dependability (is the process of research logical, traceable and clearly documented? ), transferability (are the research findings relevant to other settings?) and confirmability (are the research findings and interpretations linked to the data?). A reporting framework can also function as a screening tool for systematic reviewers to determine study eligibility and inform the development of future qualitative studies on the topic of interest. For example, it can highlight qualitative methods and methodologies that have been effective in gaining in-depth insight into participants’ perspectives, beliefs and attitudes, and identify those which could generate more understanding about a phenomena, but have not been tried and tested. Also, the process of appraisal can facilitate a deeper understanding of included papers. Existing frameworks for reporting qualitative research may be considered and used as a starting point and adapted to suit the synthesis topic. The framework should capture the range of methods and methodologies of the included studies. In some instances, multiple reviewers have independently assessed quality and discussed quality appraisal to achieve consensus. Also, the rationale for weighting or excluding studies based on quality appraisal should be explicit. For clarity of reporting the analysis process, reviewers should define which sections of the included articles were actually analysed; and describe the process of coding, comparing and interpreting the data. Specific analysis techniques and concepts are provided in Table 2. Details about use of software and number of reviewers involved in coding and analysis can allow readers to assess the dependability of the findings. It enables readers to assess whether data are managed in a systemic way. Quotations from the articles may be included to illustrate the themes or constructs identified. The target audience should also be considered when reporting and presenting the synthesis output. Ultimately, the synthesis should generate rich, compelling and new insights that go beyond a summary of the primary studies; however some “implicit judgment” and team discussion may be required to assess this. The ENTREQ statement was developed to promote explicit and comprehensive reporting of the synthesis of qualitative studies. We acknowledge it is unlikely that a standardised set of procedures will ever be developed, more probably, a ‘methodological palette’ will be created from which reviewers can draw methods relevant to the focus of their review . The proposed guidelines covers reporting items relating to methodology and methods, literature searching and selection, appraisal and the synthesis of findings. The purpose of the ENTREQ statement is to offer guidance for researchers and reviewers to improve the reporting of synthesis of qualitative health research. We believe this document can be a useful resource and reference for those learning how to conduct a synthesis of qualitative research and readers of syntheses of qualitative health research. But we emphasise that this is not an absolute, definitive framework. Also, we acknowledge that we did not complete a Delphi exercise as recommended by the “Guidance for developers of health research reporting guidelines”  due to resource limitations. However, we believe that this initial development of the ENTREQ Statement is a crucial step for the development of a Delphi exercise. We encourage authors to evaluate the checklist to assess whether it is useful for improving the completeness of reporting the synthesis of qualitative research. The synthesis of qualitative research is an expanding and evolving methodological area and we would value feedback from all stakeholders for the continued development and extension of the ENTREQ statement in terms of content, clarity and feasibility. Allison Tong, Kate Flemming, Elizabeth McInnes contributed equally to this work. Enhancing transparency in the reporting of qualitative health research. AT is supported by the National Health and Medical Research Council (NHMRC) Fellowship [ID1037162]. AT, KF, EM collected and analysed the data. AT/KF/EM drafted the manuscript. All authors critically reviewed and provided intellectual input on the manuscript. All authors read and approved the final manuscript.